What is the idea of a multipurpose WordPress theme? It is to create a tool that can will suit any type of website for any type of business, organization, or cause. Such a theme must, of course, come with all the basic features any of these website types will need. Also, they must be responsive, and able to promote and protect products. Let’s not forget about integration with social media networks, and much more. Common sense would dictate that such a theme would be a “jack of all trades and master of none”. But common sense does not always lead to the truth. There are numerous flexible multipurpose themes on the market today. They are quite capable of managing anything you can throw at them and managing it quite well. In short. The “master of none” theory is flat wrong. The fact that multipurpose themes such as the 15 described in this post are widely used proves the point. If you’re tired of searching for the perfect theme to match a client’s somewhat unique needs, and you’re not in the mood to start building a website from scratch, BeTheme may be precisely the multipurpose WordPress theme you need. This is especially true if your web-building projects tend to address a wide range of website types and client niches. BeTheme offers the largest selection of pre-built websites you’ll find anywhere; 320+ to be more precise. Finding a perfect match for virtually any client’s requirements will typically take minutes; not hours or longer. These pre-built websites are professionally designed, completely customizable, and follow the latest design trends. They have the functionality you’ll be looking for, and they can be installed with a single click. As far as actually building a website is concerned, the sheer number and power of BeTheme’s core features is simply amazing. This ThemeForest best-seller features include the popular Muffin Builder and Options Panel for the heavy lifting, plus all the design elements, shortcodes, special effects, and layout options you’re ever going to need. It all starts with Total’s easy to use demo importer. Bring up the demos on your WordPress screen and install any you like with one click. You’ll be prompted to install the necessary WordPress plugins, and after that’s done, you’re off and running. Total’s combination of its enhanced version of Visual Composer, Live Theme Customizer, and page building elements enables you to build page after page of one-of-a-kind pages. You can preview edits and changes live, so you’ll know what a website page will look like before you save it and proceed. Developers will be happy as well. Total was coded with developers’ needs in mind. All the usual hooks, snippets, and filters developers look for are there. Total is also an excellent choice for anyone planning to monetize their website as this multipurpose theme is totally WooCommerce compatible. When a new Porto user starts using this multipurpose theme’s web-building tools with its multiplicity of design options and its huge and varied selection of design elements and special effects, one of the first things that user will notice is speed! This shouldn’t be surprising given the fact that Porto was built around a Bootstrap 4 framework; a key contributor to this theme’s excellent performance. Porto is easy to use, responsive, and extremely flexible. Its many useful features include 25 homepage layouts with more on the way, Visual Composer – complete with handy web-building addons, multiple headers, social sharing features, and more. You’ll also find an excellent selection of blog and portfolio design options. As far as support is concerned, that’s another area where everything happens quickly, and with excellent results. The real estate niche is huge, it’s important, and Houzez offers the perfect match for clients in this sector and their website requirements. Everything is included in this customizable WordPress theme including listing layout options, radius and advance search and Google geolocation capabilities. Houzez is easy to work and responsive, and the websites you can build with it are as well. If you’ve become tired of building websites from scratch, you can say “never again” with Uncode at your fingertips. This user-friendly theme has the firepower you need to deliver high-performance, super-attractive products to your clients, time after time; and without any need for coding. Need to be convinced? Visit the Uncode website and browse its showcase of customer-built websites. Starting with its selection of 70+ beautiful design concepts, this amazing one page/multipage-ready multipurpose theme doesn’t stop there. TheGem’s features include more than 200 creative page templates (demos), shortcodes, widgets, multiple header and footer options, unlimited layout possibilities, and much more. Smart tools, such as the latest Visual Composer, plus the intuitive GUI, make website, blog, and portfolio building easy; with no coding required. TheGem is rightly referred to as the “Swiss Army knife” of WordPress themes. 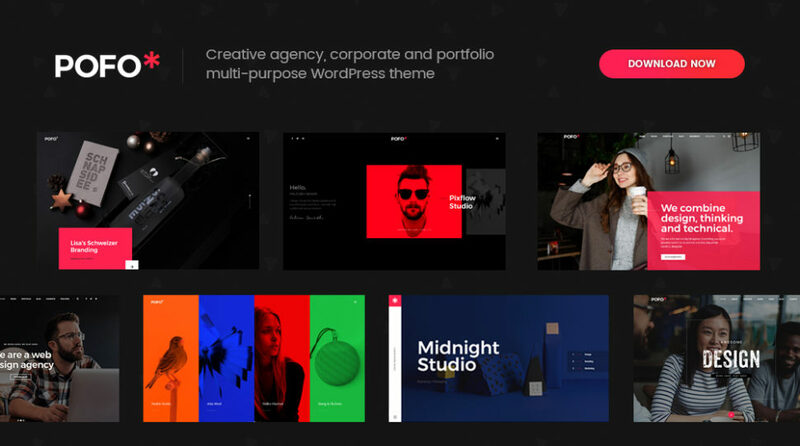 Pofo is a modern, creative multipurpose theme for agencies, artists, creative teams, and corporations. Its designs are pixel perfect, fully responsive, and in line with the latest web design trends. This premium theme is extremely flexible and customizable, blazing fast, SEO optimized, and WooCommerce ready. Pofo utilizes the WordPress native real-time customizer with its approximately 1000 layout customizing options. Themify Ultra’s unique selection of pre-made demo sites, design skins, and highly customizable design elements make it ridiculously easy for you to build any site your clients need and do so quickly. You’ll have a variety of header, footer, and post layout options at your fingertips, along with a free post type plugin. WooCommerce support is there for you as well. 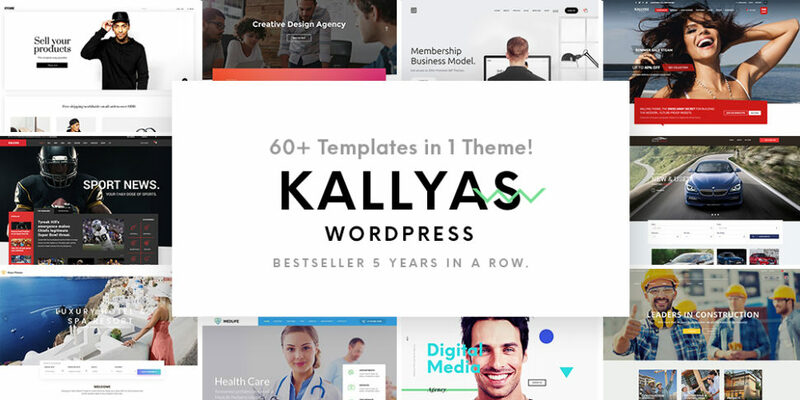 Kallyas is built on a Bootstrap framework, the result being a responsive, high-performance multipurpose theme that is super-fast and easy to work with. Features include plenty of pre-made website templates and an integrated visual builder. With Kallyas you have all the web-building features you need without being loaded down with extras. This theme’s excellent support includes live chat and more than 150 video tutorials. The Layers multi-purpose theme is SEO-friendly, responsive, and WooCommerce ready. It’s also free. There are charges for a Pro version with extra features. The free default version is certainly worth a try, as it has all the features you’ll need to make a website, such as its point and click editor and a library of preset page layouts, that will more than satisfy most clients’ needs. Here’s a pick that could make your life as a web designer much easier. Fildisi adjusts to your rules, rather than the other way around, whether your need is for a general website or a special purpose one. This multipurpose WordPress theme has everything needed to satisfy anyone from designers and bloggers to corporations and agencies. Movedo is another multipurpose theme build with creatives in mind. You can tell that from the get-go as you begin to familiarize yourself with its truly remarkable features. There are unique clipping animations, ultra-dynamics parallax, moldable typography, to name a few. If website sameness has become a problem, Movedo will help you break the mold and rock the user world in the process. You can build anything with Hestia, especially when you get a helping hand from Elementor’s 50+ templates, the OrbitFox plugin, and a nice assortment of extra widgets. Better yet, you can get your next project off to a blazing start with this WP theme’s free version. Hestia is based on Material Design principles. Its single page format makes navigation easy for both you and the website users. There are online stores, and there are online stores that positively rock. If the type that positively rocks is in your sights, XStore is just the right tool to make it happen. This minimalist and elegant WordPress theme features 70 ready-to-go shops with 1-minute installation, premium plugins including the Smart Product Reviewer 360°, and WooCommerce Infinite Scroll, and a stunning showcase of clients’ websites. Stormyday is a WordPress blog theme that is designed to help you make a statement. This multipurpose flexible theme offers a virtually unlimited variety of page layouts, a full range of live demos with a one-click demo install and the brand new PremiumCoding page builder. The package also comes with plenty of CSS3 features and animations, Revolution Slider, smooth scrolling, and parallax backgrounds. Stormyday is responsive and retina ready. There’s certainly no shortage of excellent choices here. So many in fact that it might take you some time to narrow things down to 2 or 3 products. 15 products could still be looked upon as a shortlist, however. These are 15 of the very best multipurpose WP themes on the market. I want to add one more in your list – Kosmic WordPress Theme. It has lots of awesome features customized theme options, Inbuilt custom widgets, fully responsive, cross browser compatibility, AJAX shopping cart, well designed mega menu, awesome blog designing options, etc.